There is no doubt about the fact that Tourism in India is rapidly growing. With the remote and beautiful places becoming more accessible and the tour packages to these places becoming cheaper and affordable, people nowadays are tapping on to their wanderlust desires. Visit to a new place, city, town or a country is definitely incomplete without a stay a hotel, tavern or an inn. Airport Hotels: hotels providing lodging for a day or overnight travellers and are in close proximity to a city’s airport. Business Hotels: hotels which aim to cater needs of business clientele and provides facilities, like conference halls, exclusive lounge, and complimentary breakfast etc. for a successful business trip. Home stays: these are a private kind of hotels where the house owner provides guest rooms of their house, for a price of course! Resorts: thinking of a spa, recreational activities and luxurious rooms? Then you should definitely choose a resort which are location of exotic locations and unquestionably make your vacation memorable. Serviced Apartments: one can rent a serviced apartment, if they are planning a month long or so vacation to a place. These apartments are fully furnished and have all the basic facilities including, bedroom, living room, cutlery and other kitchen utensils etc. One you have chosen the type, check the location of the type of Hotel. 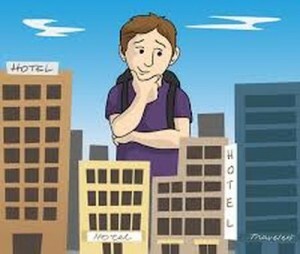 You should check whether the hotel is in close proximity to local sightseeing places or is far away from it, all depending on the type of vacation you want. For example, In Goa, most of the sightseeing is present in North Goa but to not miss out on the old charm of South Goa, you might have to travel for an hour or two. So, it is best to choose a hotel where you don’t have to travel long distances. Now having a vacation is one thing, it is equally important to keep a check on the pockets while we are on a vacation. It all depends on your vacation. If you plan to just sleep overnight in your hotel after spending the entire day outdoors, it is not sensible to spend money on a seven star or highly priced hotel. So enjoy your vacation too, but plan sensibly so that you don’t end up spending all your money on a hotel where you would only stay for 4 to 5 hours. Some of the best stories are told by people who have already experienced the kind of vacation you want to have. Don’t follow the reviews of a hotel blindly though. If you are reading a review, read the full review because sometimes people give a bad review for something they have witnessed personally which may or may not be the case for you. Reviews are important but just read them for a reference and the ultimate decision should be yours and not biased to a review. In concluding, the next time you choose a hotel, check these pointers off your list and you would end up with a vacation of a lifetime! One can also choose to make career out of Hotels. If you think a Hotel should be of a certain kind, or are impressed by the Hospitality and Tourism industry, why not make a career of it. The future of Hotel Management is bright in India, thanks to the rising tourism. The eligibility is simple; there are many Hotel Management colleges in India to choose from and the salary in the hospitality business is above 5 lakhs INR at an average. Give it a thought!